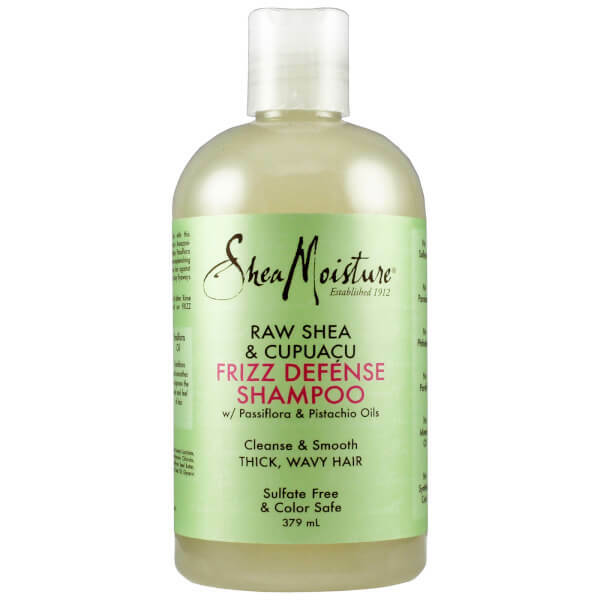 Catering specifically for thick, wavy hair, the Shea Moisture Raw Shea & Cupuacu Frizz Defense Shampoo gently cleanses, hydrates and protects strands from root to tip. Infused with a host of beneficial ingredients, including Amazonian Cupuacu Butter and certified organic Raw Shea Butter, the lightweight formula eliminates impurities, whilst delivering essential moisture to leave hair smooth, sleek and manageable after every use. Defends against environmental aggressors and pollution for a frizz-free, salon-worthy finish. Water, Decyl Glucoside, Cocoamidopropyl Betaine, Sodium Lauroyl Lactylate, Fragrance (Essential Oil Blend), Guar Hydroxypropyltrimonium Chloride, Butyrospermum Parkii (Shea) Butter*#, Theobroma Grandiflorum Seed Butter, Passiflora Incarnata Flower Extract, Pistacia Vera(Pistachio) Seed Oil, Glycerin (Vegetable), Caprylhydroxamic Acid, Caprylyl Glycol. *Certified Organic Ingredient. #Fair Trade Ingredient.